Mendy Fry drove the High-Speed Motorsports AA/Fuel dragster to victory over Jim Young and the Young Guns in a fierce Top Fuel final at the Holley National Hot Rod Reunion presented by AAA Insurance at Beech Bend Raceway Park in Bowling Green, Kentucky. Mendy Fry and Jim Young in Qualifying at the 2018 Holley National Hot Rod Reunion in Bowling Green, Kentucky. Runner-up Jim Young took the Young Guns dragster from the number two qualifying slot into the decider and posted event Top Speed even after getting out of the groove and drifting towards the wall before crossing the stripe at 256 MPH. “It got away from me a little bit”, said the Wisconsin-based contender, who didn’t make the decision to head out to Bowling Green until the Sunday before the race. Young also grabbed Top Speed in qualifying with a 254 MPH blast and has his eyes on pushing the Young Guns dragster to 270 MPH. 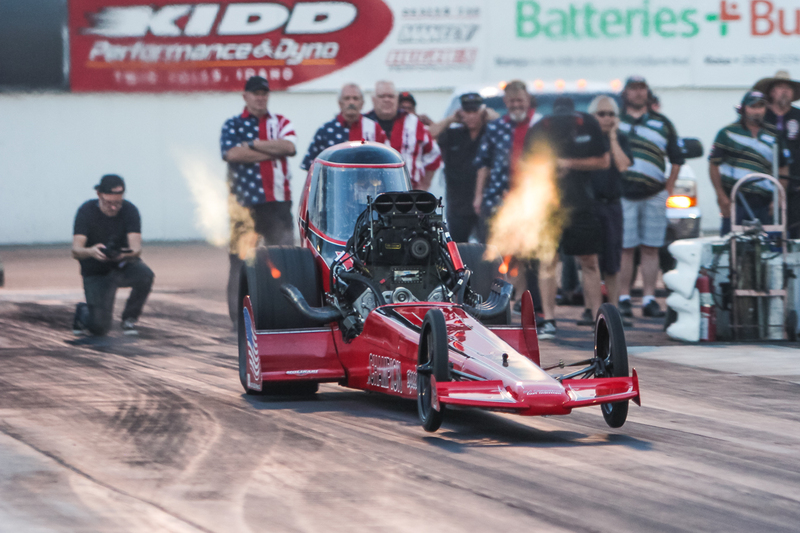 Mendy Fry credited her victory to Crew Chief Tom Shelar and the High-Speed Motorsports dragster team for taming often unpredictable nitromethane with race-winning consistency from number one qualifier to the winner’s circle. “It was a bracket car all weekend. He knows how to read this track. In this heat, the track is 150 degrees and it’s greasy. He gave me a car that could win.” Fry’s victory at Bowling Green puts her at number one in the NHRA Hot Rod Heritage Top Fuel points championship heading into race three of the 5-race series. Top Fuel Eliminations kicked off on a 90-plus degree Saturday. Jim Young moved onto the semi-final with a 5.81 ET at 251 MPH over Jason Greenwood, who ran a 6.22 ET at 237 MPH. Mendy Fry took a first round win with a 5.68 ET at 243 MPH over Julius Hughes who got the hole shot with a .043 light and ran a 6.33 ET at 231 MPH after stepping up the Atlanta Speed Shop dragster all weekend. Turbo Tim Cullinan rapped the throttle and cackled the Irish Bomb down the track into the semi-final after a blower belt failure shut Dusty Green down and the Nitro-Hemi was backed out of the box after the burnout. Brendan Murry blasted his 426 hemi-powered Running Wild to a 6.00 at 200 MPH for the win over Adam Sorokin, who struck the tires and pedaled the Champion Speed Shop small block Chevrolet in pursuit to a 6.39 ET at 221 MPH. Dusty Green’s gremlins ambled over to the Irish Bomb in the Top Fuel Semi-Final as Turbo Tim Cullinan was pushed back out of the box with a broken throttle cable and Mendy Fry took the round on a single with a 5.71 ET at 220 MPH. “That’s drag racing”, said Cullinan who qualified in fifth place with a 5.95 ET at 213 MPH. Brendan Murry left on Jim Young but lost traction after the Running Wild made too much power for the tires. 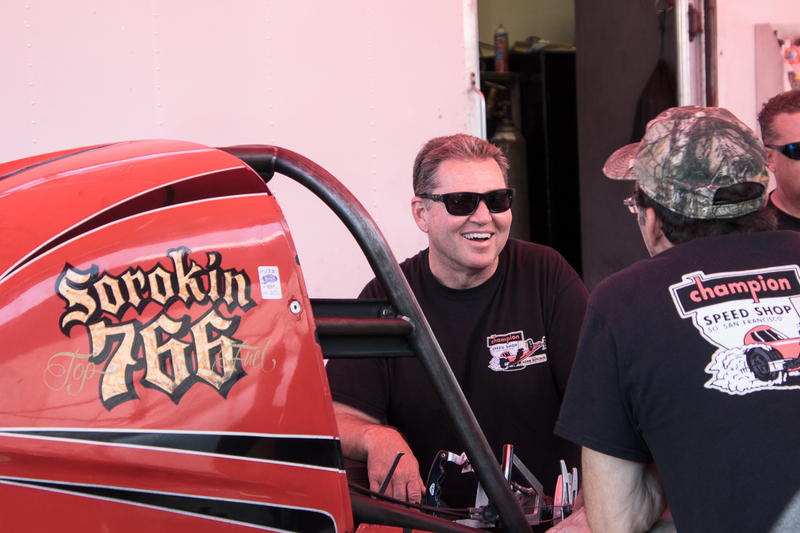 “I ran out of track”, said the smiling San Jose, California based Top Fuel racer who was satisfied the Running Wild was back into the 5-second zone and his win against Adam Sorokin and the South San Francisco based Champion Speed Shop. 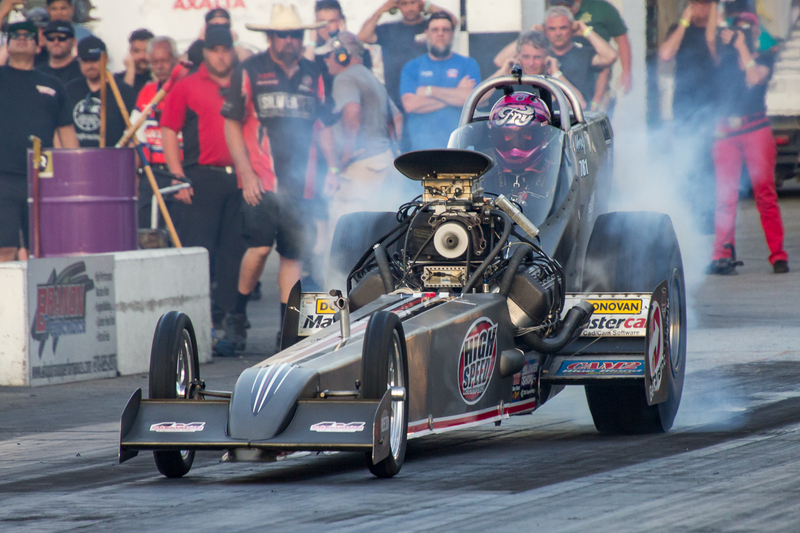 The Top Fuel fight on the way to the final was as hot as the weather and It was brutally hot at Beech Bend Raceway in Bowling Green, Kentucky. Eleven Top Fuelers showed up to rumble, but only eight could battle for the title. Diamond Dave Miller ran a 6.14 ET at 166 MPH for the 9th position. Paul Schultz took the Spirit of Tulsa to a 6.54 ET at 194 MPH and tenth position. Tyler Hilton carried the Great Expectations III to a 7.50 ET at 213 MPH as the fearsome sounding big block Chevrolet overpowered the tires. Next stop for the All American Fuel Dragster coalition is the 47th Pepsi Nightfire Nationals at Firebird Raceway in Boise, Idaho August 9th-12th for the third race in the runup towards the 2018 NHRA Hot Rod Heritage Racing Series Nostalgia Top Fuel championship title.